Hey Guys! I just wanted to take a second and introduce myself! My Name is Kyle Delello and I have been in the Hobby for a couple years. I run a Red Sea 750XXL and I am a major fish nerd. 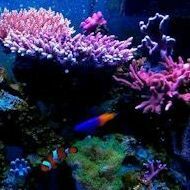 I have some soft coral and LPS, but my tank is dedicated to the fish! I don't have a good excuse as to why it took me so long to join here, other than I spend tons of time on Reef2Reef as I am a moderator there. 3fordfamily is a very good friend of mine, I HOPE THAT DOESNT COUNT AGAINST ME I also have 6 QT's in my basement as I am a major fish disease nerd and I am constantly trying new methods for treatment for the betterment of our hobby. Look forward to meeting some local hobbyists!!! to Indy! More importantly welcome to the salt life! Hello all, I just became a member a few months ago, and attended the swap for the first time. All I can say is wow! The time, and energy, that must have been spent on that! Awesome job to all involved! Looking forward to the next event! Looks great. Love the top down shots. welcome!!! Ive enjoyed following your build on Reef2Reef! !